Let’s talk about our dear Duchess of Cambridge, Kate Middleton. 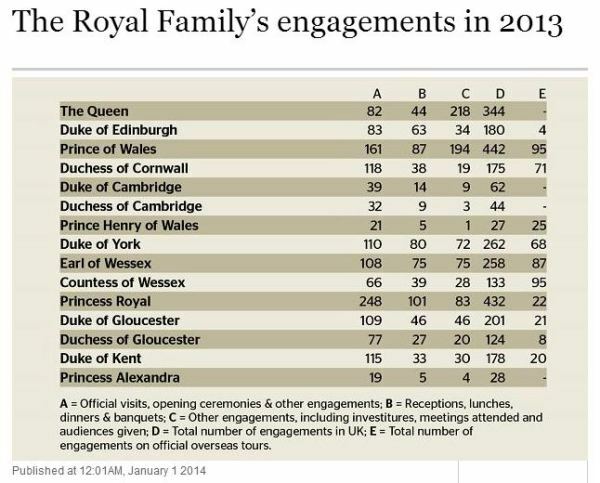 Kate undertook 44 engagements (according to O’Donovan) during 35 days (according to the Danish study) of 2013. According to O’Donovan, Kate undertook 32 “official visits, opening ceremonies & other engagements”, 9 “receptions, lunches, dinners & banquets”, and 3 “other engagements, including investitures, meetings attended and audiences given”, for a total of 44 engagements in the UK, with none overseas. The Court Circular is on the Palace’s website now, and I counted each day Kate’s name appeared, and when I counted I only came up with 34 days, so I have no idea where the Danish study got that last day from. As I suspected, Kate did multiple engagements on a couple of days, which is why she did 44 engagements on only 34 days of work. The Court Circular also lists meetings and lunches that the public didn’t see. So, let’s compare her numbers to previous years. In 2011, Kate did 34 engagements: 15 in the UK and 19 overseas (Canada/LA tour). In 2012, Kate did 111 engagements: 75 in the UK and 36 overseas (SE Asia tour). In 2013, Kate did 44 engagements: 44 in the UK and 0 overseas. Yikes. The low number for this year is because she was “sick” and pregnant and didn’t want to work much, and then she had George and didn’t want to work much. In comparison, Prince Philip—who is 92 and had exploratory surgery this year—did 180 engagements in the UK and 4 overseas. Kate better step up her game in 2014, these numbers are just sad. 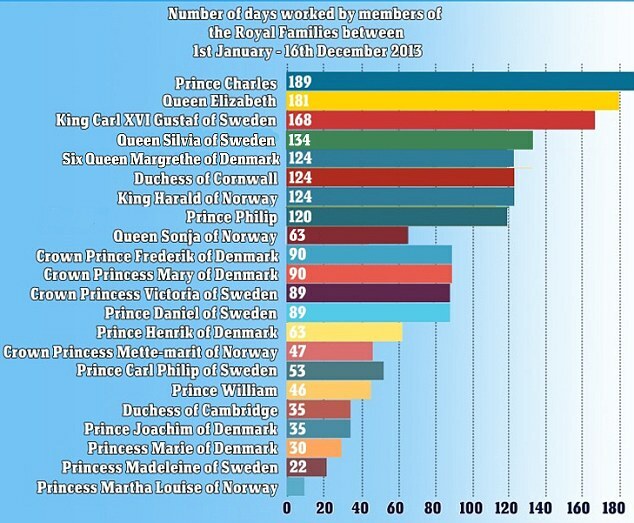 I do want to mention the Danish study of number of days worked, because the Court Circular is impressive with Charles’ 537 engagements. BUT, that all amounts to 189 actual days of work. He is the highest ranked royal—out of all the royals, including the European ones—but let’s compare that to the average person working Monday-Friday, who works approximately 261 (minus official holidays and any sick days taken) days a year. Good for Charles for working the most, but that still doesn’t mean he’s anything like the hardworking public. Thanks for summing up these numbers for us. While it is clear that no one on this list is really setting himself up as a workaholic, it completely reinforces the fact that Will and Kate are practically Missing in Action by comparison. I am just glad that I am American and only have to worry about my government/elected officials squandering my hard-earned money. Harry also is practically MIA, with only 52 engagements this year. I realize that Will, Kate and Harry are not “full time royals”, but it is sad that they don’t even do half the amount of work that royals in their 70s/80s/90s do. And I don’t believe the “William and Harry have full time jobs in the military” excuse people try to lobby. Both William and Harry take an inordinate amount of time off to go party and vacation and whatnot for people supposedly working full time. I think those jobs–especially William’s–is/was more of an excuse to not do royal duties full time. Especially since neither of them would have those jobs if not for the HRH in front of their name–William would not have been a pilot because he wears corrective lenses, and Harry had to have help and retake tests in order to pass. 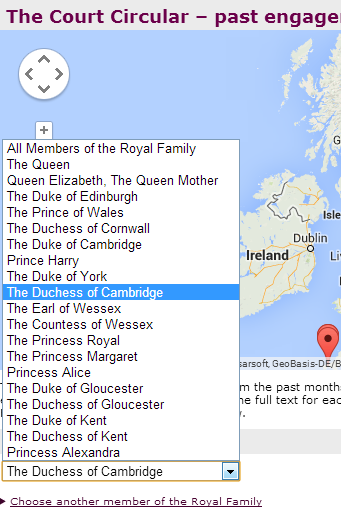 I will argue that there is no such thing as a part time royal. Either you’re a royal or you aren’t. By the way, I just found your blog and appreciate the fact that you aren’t rabid about things. A lot of the non-fan blogs lose me with their over the top dislike of every single molecule of air they breathe. You have an excellent point, they are royal 24/7 whether they like it or not. Even when they’re not doing public appearances they are still royal, still living in palaces and off taxpayer money. Which is all the more reason for them to make as many public/charity appearances as they can so that they can kiss up to the public. I guess I should say they’re not “full-time *working* royals”, since they are always royal they just don’t do much. I started this blog because all the blogs I visited always went overboard on the criticism (and it wasn’t always deserved, and sometimes hypocritical–like calling Kate out for wearing red to a wedding, but then praising one of Will’s old girlfriends for looking great while wearing red to a wedding), and whenever I commented I always got angry responses–even though I’m not a fan and criticized them too, but not as rabidly as they did. So I started my own. And your POV is why I will start to read your blog. Thank you!